Verona, Italy (March 14, 2019) – Wine Spectator, Veronafiere, and Vinitaly are pleased to announce that OperaWine, Finest Italian Wines: 100 Great Producers selected by Wine Spectator, will take place on Saturday, April 6 in the Palazzo della Gran Guardia in the city of Verona as part of Vinitaly’s grand opening. For the 8th year in a row, Wine Spectator has selected over 100 of the finest Italian producers after rigorous blind tastings in their New York City headquarters. The exclusive tasting event invites producers to pour their wines in Verona as international journalists, sommeliers, and wine professionals alike experience the excellence of Italian wine. Since 2012, the OperaWine event aligns with Wine Spectator’s commitment to showcase the best of Italian wine, and Italian wine culture. The magazine’s April 30, 2019 issue devotes its cover story to “Italian Gems,” which highlights ancient grapes, modern wines, cultural treasures, and the country’s viticultural and oenological heritage. There is also a special feature dedicated to Verona’s thriving wine bars and culinary culture—a testament to Wine Spectator’s passion for the city of Romeo and Juliet. The 2019 wine selection from Wine Spectator includes a total of 103 labels from every region of Italy. To keep the tasting interesting and fresh, the editors carefully selected 15 producers who will participate for the first time, along with some who are returning after a hiatus of a year or two. The most significant change in the lineup is seen from the Montalcino area and its Brunello producers, a testimony to the large number of excellent producers in the region. Overall, the wines will encompass more than 70 red wines, 15 whites, and 10 sparkling and dessert wines, and include bottlings that date all the way back to the 1998 vintage. In addition to wine, there is a visual campaign that traditionally defines OperaWine. This year’s graphic art campaign includes a geometric and abstract theme chosen by Generative Art—essentially art that generates art—which has its early roots in the anti-war Dada movement and whose artistic expression focused on non-sensical imagery and the idea of chance, although, traditionally, British artist Harold Cohen is seen as its founding figure for this trend. Cohen’s Generative Art aesthetic was centered on the creation of a computer-programmed robot that, in turn, took on the role of the creator independently generating artistic patterns. The underlying concept in this type of expression is the search for harmony between a man-made creation and an autonomous system over which artists have partly relinquished their creative input. This year’s event will celebrate the skill and dedication of Italian wine producers and their magnum opus in a protean, polychromatic tasting gala. OperaWine gives a special thanks to its sponsors, including Volkswagen Italia (Main Partner); Luxochain, Grana Padano, and Grissinbon. The full list of OperaWine Producers for 2019 includes: Aldo Conterno; Allegrini; Antoniolo; Argiolas; Arnaldo Caprai; Avignonesi; Baricci; Bastianich; Bellavista; Benanti; Binomio; Bisci; Bortolotti; Boscarelli; Braida di Giacomo Bologna; Ca’ del Bosco; Canalicchio di Sopra; Cantina Sociale di Santadi; Cantina Terlano; Cantine Lunae Bosoni; Carpineto; Castellare di Castellina; Castello d’Albola; Castello di Ama; Castello di Volpaia; Cavallotto; Cesari; Cleto Chiarli e Figli; Di Majo Norante; Donnafugata; Elena Fucci; Elena Walch; Elvio Cogno; Eredi Fuligni; Falesco; Falletto di Bruno Giacosa; Fattoria di Fèlsina; Ferrari; Feudi di San Gregorio; Feudo Maccari; Fontodi; G.B. Burlotto; Gaja; Garofoli; Gianfranco Fino; Gini; Giuseppe Mascarello & Figlio; Grosjean Freres; Hofstätter, Jermann; La Stoppa; Le Colture; Le Macchiole; Leone de Castris; Leonildo Pieropan; Lisini; Livio Felluga; Livio Sassetti; Lungarotti; Maculan; Mamete Prevostini; Marchesi Antinori; Marchesi de’ Frescobaldi; Marchesi di Barolo; Marco Felluga; Masciarelli; Masi; Massolino; Mastroberardino; Mazzei (Castello di Fonterutoli); Montevetrano; Morgante; Nino Franco; Nino Negri; Odoardi; Ornellaia; Paolo Scavino; Paternoster; Pietradolce; Planeta; Prà; Produttori del Barbaresco; Quintodecimo; Renato Ratti; Roagna; Roberto Anselmi; Rocca delle Macìe; Salvatore Molettieri; San Felice; San Filippo; San Martino; Tabarrini; Tasca d’Almerita; Tenuta delle Terre Nere; Tenuta Pederzana; Tenuta San Guido; Tenuta San Leonardo; Tormaresca; Tenuta di Trinoro; Umani Ronchi; Vincenzo Ippolito; Vietti; Zenato. The grand Vinitaly 2019 will be held from April 7th to the 10th. Every year, Vinitaly counts more than 4,000 exhibitors on a 100,000+ square meter area and 130,000 visitors from over 140 different countries with more than 30,000 top international buyers. The premier event to Vinitaly, OperaWine “Finest Italian Wines: 100 Great Producers selected by Wine Spectator” which will be held on the 6th of April, one day prior to Vinitaly will unite international wine professionals in the heart of Verona, offering them the unique opportunity to discover and taste the wines of the 100 Best Italian Producers, as selected by Wine Spectator. 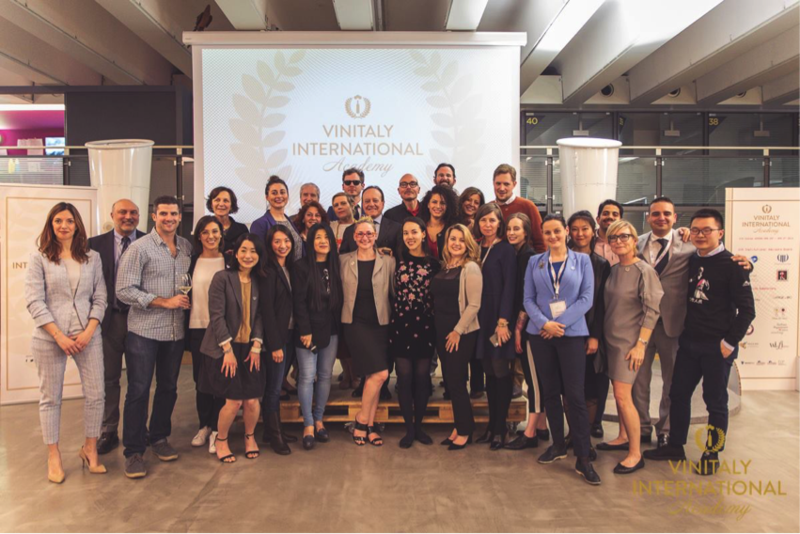 Since 1998 Vinitaly International travels to several countries such as Russia, China, USA and Hong Kong thanks to its strategic arm abroad, Vinitaly International. 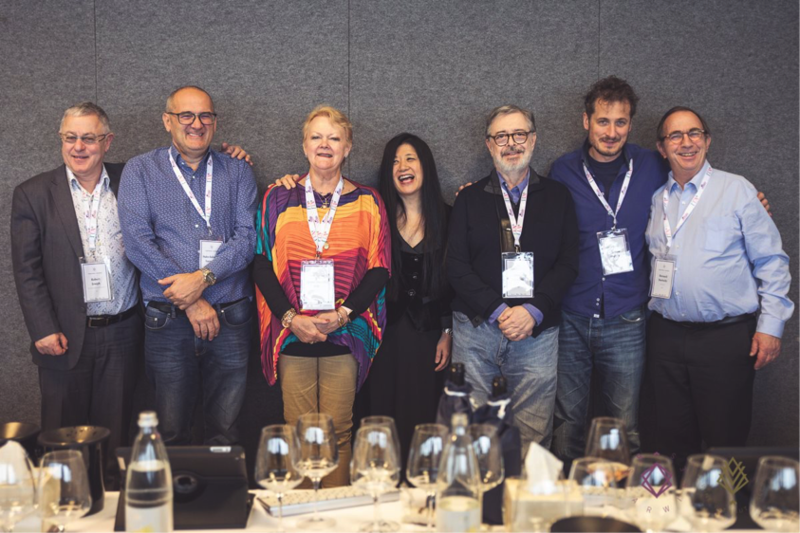 In February 2014 Vinitaly International launched an educational project, the Vinitaly International Academy (VIA) with the aim of divulging and broadcasting the excellence and diversity of Italian wine around the globe. VIA this year launched the seventh edition of its Certification Course and today counts 164 Italian Wine Ambassadors and 13 Italian Wine Experts. 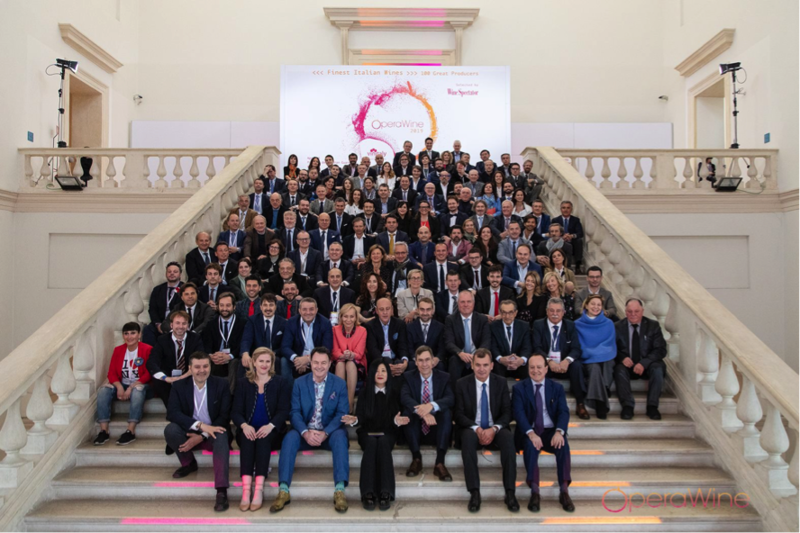 Photograph: Italian wine producers at OperaWine 2019. Sitting in the first row left to right: Raffaele Boscaini (Masi Agricola); Wine Spectator Editors Alison Napjus and Bruce Sanderson; Stevie Kim (Vinitaly International); Thomas Matthews (Wine Spectator’s Executive Editor); Maurizio Danese (President of Veronafiere); Giovanni Mantovani (CEO of Veronafiere).